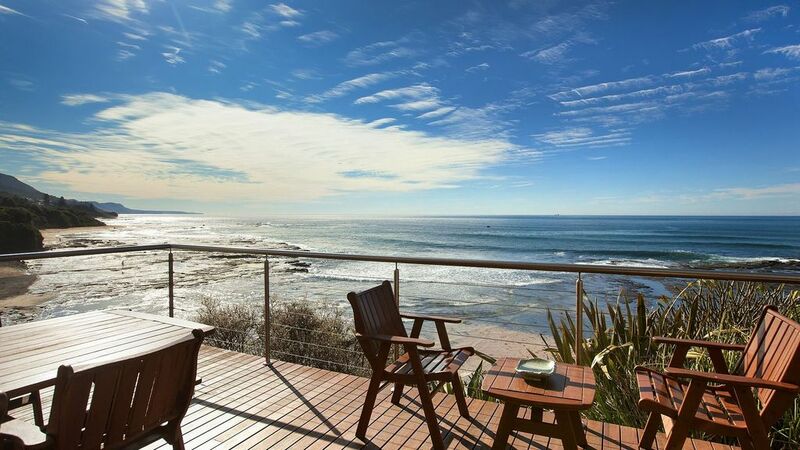 Escape to this architect designed luxury home with superb ocean and coastal views and direct access to the water and also Coledales fabulous rock pool. Cook up a storm in the Gourmet Kitchen while talking to your family or friends in the open plan and spacious living and dining room! Bi fold doors open onto a large private deck where you can cook a BBQ and dine or sit back and take in the view. Upstairs contains 3 generously sized bedrooms, 2 with Queen Beds and views all the way up the coastline. You can step onto your balcony and feel as though you are at one with the Ocean! With 2 bathrooms upstairs and a powder room downstairs bath. This property is a Gem! Sleeps maximum of 6, 2 queen size beds and 2 singles. Available for weekend or weekly bookings, and located just a 1 hour drive from Sydney. Bed sheets and towels are not included you can choose the convenient option to hire these or bring your own. •Pricing is subject to change, and a minimum stay period and other conditions may apply. Many thanks and appreciation to the owner for allowing us to stay in their beautiful home. They have made the entire house so inviting and you feel the sense of home straight away. "SeaDeck" was the perfect setting to prepare for my daughter's wedding. Fantastic house perched on the cliff edge. They even provide you with all the essentials, so next time I won't need to take a thing except our beach towels. It a perfect place for a getaway, listening to the waves as you go to sleep. Loved getting visited by a family of lorikeets in the mornings and afternoon. Still pinching ourselves! Luxury close to home! Amazing property with spectacular views of the ocean. The home is immaculate, filled with artwork and treasures, giving a sense of warmth and beauty. The living area is spacious and not cluttered, beautiful and clean, cosy and comfortable. Upstairs is just as delightful! Fresh and airy bathrooms, large bedrooms with balconies allowing for extended views of the crystal blue ocean. We enjoyed our stay at SeaDeck the property is in a great location, however this was tainted slightly by being charged $160 for a broken bed which we had no recollection of damaging. The damage could have been there the whole time for all we knew. I would be wary about laying down your $1000 bond/deposit for this property. Wonderful property. Everything you need and more. Just note the advertised $300pn + $Linen Fee +$Cleaning Fee - but if you can afford it - it is worth it.